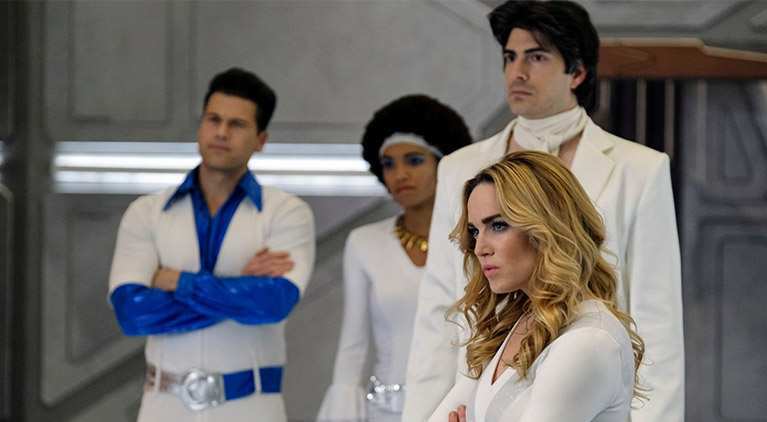 'Legends of Tomorrow' Recap With Spoilers: "Here I Go Again"
"Here I Go Again" begins with Zari trying to convince Gideon to run some simulation software she designed. Trying to hide the simulation from the rest of the team, Zari's nearly outed when they return earlier than anticipated from a mission. When Sara asks Gideon if their mission was successful, Gideon shuts down. Zari reveals she tried hacking Gideon's system to find a way to keep her home from getting destroyed in the future. Upset, Sara orders Zari to fix the ship. Zari goes downstairs to fix the ship when she unplugs the wrong cord and the ship explodes. Zari's suddenly transported back in time to the moment she just shared with Sara and Ray. Zari goes back to try fixing the ship, again. She's not sure what's going on and goes to investigate further. She finds Nate and asks if noticed anything weird a few minutes ago, and he couldn't recall. Ray says the same. Zari goes back to fix the ship, only for it to explode again. She's transported back in time again, to the same moment with Sara and Ray. She tries convincing the rest of the group that she's stuck in a time loop, predicting that Ray's going to trip. She warns the group that the ship is going to explode in an hour and the group thinks she's suffering from some sort of cabin fever. Escaping from the med bay, Zari talks to Nate and he compares her situation to Groundhog Day. He says that if she goes back in time again, to tell him about the movie. Shortly thereafter, the explosion happens again and Zari goes back in time. She runs down Nate and mentions Groundhog Day to him, and he remembers their talk about a time loop. They start to work on investigating the explosion and they think it might be one of their teammates causing it. The explosion happens again, and Zari tracks Nate down again. They begin investigating the other team members, thinking that maybe one of them accidentally triggers the explosion. They begin looking into Rory, but he's rigged his living quarters with various traps to keep people out. Eventually, they're able to clear both Rory and Amaya as they're doing other things when the explosion happens -- so they move on to Ray. They approach Ray and explain the Groundhog Day scenario to him and convince him to help spy on Sara, thinking she might cause the explosion under possession from Mallus. Ray shrinks both himself and Zari down so they can spy on Sara, and they walk in on her talking to Agent Sharpe romantically. The ship explodes again, and expressing how tired she is of the time loop, Nate convinces Zari to start having fun since it's an infinite time loop. She starts playing pranks on various teammates until the ship explodes again. On the bridge, Zari tries killing herself to stop the time loop, but the gun jams. After the scene, Zari's able to convince Sara and Rory that they're in a time loop. The group soon finds a member of the Time Bureau stuck in the trash compactor. He tried breaching the ship to help save them from the time loop, but Rory inadvertently destroyed the time loop-stopping device by mistaking it for a bomb. The group rendezvous on the bridge and Rory suggests that the bomb might be stuck in the 8-track he destroyed earlier. Much to everyone else's surprise, Rory's suggestion turned out accurate. Zari takes the bomb and goes into the library, turning on the force field behind her so the rest of the team can't reach her. Hiding behind the force field, Zari says words to encouragement — motivational information she learned over the course of the time loops — to the rest of the team. Zari turns on her amulet and starts to use her powers in an attempt to contain the bomb explosion. The clock on the bomb counts down and when it reaches zero, the rest of the team disappears. A lady walks in to talk to Zari, and we find out it's Gideon's physical body. Gideon reveals that the glowing sludge that sprayed in her face earlier is a highly volatile substance that knocked her out, and the time loops have essentially been a dream. Gideon created the time loops in an effort to build better relationships between Zari and the rest of the team. Zari wakes back up in the med bay and talks to Sara and Ray about the scenario Gideon just put her through. Sara and Zari go get a cup of coffee and talk about scenarios in which the team can band together and save Zari's brother. Thankful for her advice, Zari convinces Sara to ask out Agent Sharpe. In present day China, Wally West is meditating when he's approach by Rip Hunter, asking for his help.